Our top 100 NFL players of 2011 countdown continues this week -- with numbers 90-81. 90. 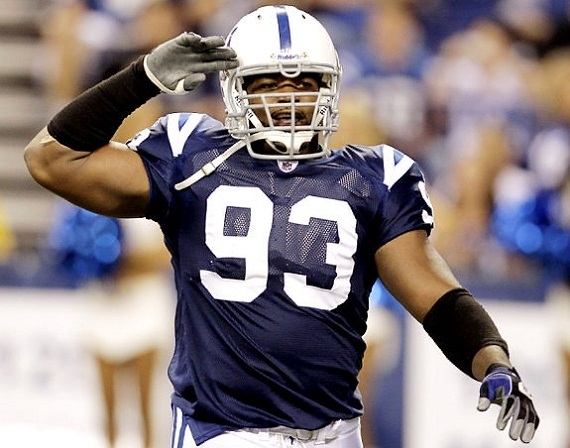 Dwight Freeney - DE, Indianapolis Colts: Freeney's productivity has fallen over the last few seasons due to injuries, but he still has the ability to get to the quarterback and disrupt the passing game. Last season, he had 8.5 sacks and 2 forced fumbles. 89. Derrick Johnson - LB, Kansas City Chiefs: After an injury in 2009 limited Johnson's production, he bounced back with two-straight impressive seasons to crack this year's top 100. Last year, Johnson had 131 tackles and 2 interceptions, so expect him to be a difference-maker on defense for the Chiefs again in 2012. 88. NaVorro Bowman - LB, San Francisco 49ers: Bowman was taken in the third round of the 2010 draft, and needless to say -- he has surprised a lot of people. Last season, Bowman had 143 tackles, and was voted to the All-NFL 1st team by the associated press. 87. Carl Nicks - G, Tampa Bay Buccaneers: Nicks was drafted in the fifth round by the Saints back in 2008, and since 2009, he started every game for them. That tells me he's very dependable. He'll be a nice addition to Tampa Bay's offensive line in 2012. 86. Vince Wilfork - NT, New England Patriots: The big 325-pound defensive lineman doesn't get very many tackles each season, but that's not his primary job. He's supposed to stuff the middle to slow down the run, and that's exactly what he does. In fact, there may not be anyone better at slowing down the run in the NFL. Wilfork had 52 tackles in 2011 along with 3.5 sacks and 2 interceptions. 85. Chris Long - DE, St. Louis Rams: Long has finally developed into the type of impact defensive end the Rams were hoping he would be when they selected him second overall in the 2008 draft. Last year, he had 37 tackles and 13 sacks. 84. Darren Sproles - RB, New Orleans Saints: Sproles is one of the best all-around players in the NFL. He's a threat rushing, receiving, and even on special teams in the return game. In 2011, Sproles set the single-season all-purpose yards record with 2,695 total yards. 83. London Fletcher - LB, Washington Redskins: Since 2000, Fletcher has has over 100 tackles every season but one, and that season he had 90. So the bottom line is -- he's one of the most dependable linebackers in the entire league. Last season, Fletcher had 166 tackles, 3 forced fumbles, and 2 interceptions. 82. Michael Turner - RB, Atlanta Falcons: Since coming over to Atlanta from San Diego back in 2008, Turner has rushed for over 1,300 yards every season but one, and the one season he didn't hit that mark he missed a lot of time due to injury. In 2011, Turner rushed for 1,340 yards and 11 touchdowns. 81. Tony Gonzalez - TE, Atlanta Falcons: Gonzalez will be a productive player in the NFL until the day he retires. Now in his mid-30s, he still has great impact on games and puts up very impressive numbers at his position year-in and year-out. In 2011, he had 80 receptions for 875 yards and 7 touchdowns. Hope you enjoyed numbers 90-81. We're taking next week off, so be sure to check back here on the 15th for our next ten!